Happy Wellness Wednesday friends! If you’ve been following me for a while, you know I absolutely love working out and fitness is a huge part of my life. One of the questions I get asked pretty often from you guys is “how do you keep yourself motivated?” So, today I want to chat about some fitness motivation for you guys. Finding motivation that’s greater than a beach trip or trying to get to a # on a scale. My true reason for staying motivated with workouts + what helps me on the hard days! Over the past few years, as I’ve been learning how to run my own business…I’ve learned how insanely important it is to know your why. Not just in work or in fitness but in ALL aspects of life. Why do I get up and do what I do everyday? If you don’t know your why…the excitingness of a new job fades. The new years resolution hype dies down. And then where are you? 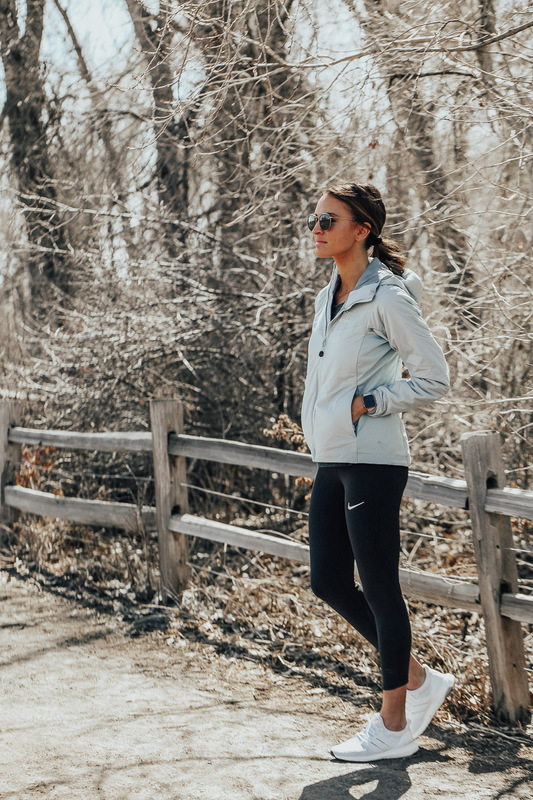 When it comes to fitness – knowing your WHY is so important, and what will allow you to stay consistent with your workout routine. Right now, spring break is probably just around the corner and maybe you wanna feel like a 10 in your swimsuit. Totally get it! But I want to challenge you guys to find a deeper motivation for hitting the gym. Deeper than your appearance. When you take the time to exercise and treat your body right…this activity truly does wonders for both your mind and your body! Taking the time to workout will not only make you feel less stressed and happier, but that in turn makes you a better mom, wife, co-worker etc bc you are taking care of yourself! We all know that exercise has amazing physical benefits for your body…weight management, muscle tone, healthier heart, longer life span, etc. But when you’re finding your ‘why’, and trying to keep yourself motivated to stay active…think of the benefits that are greater than that. Taking 45 minutes to get your heart rate up, take a break from work or from kids, will inspire you, empower you, and ease your stress load EVERY time. THAT is why, I make exercise such a priority in my day to day life! Running outside is one of my favorite ways to relieve stress and regain energy and perspective. 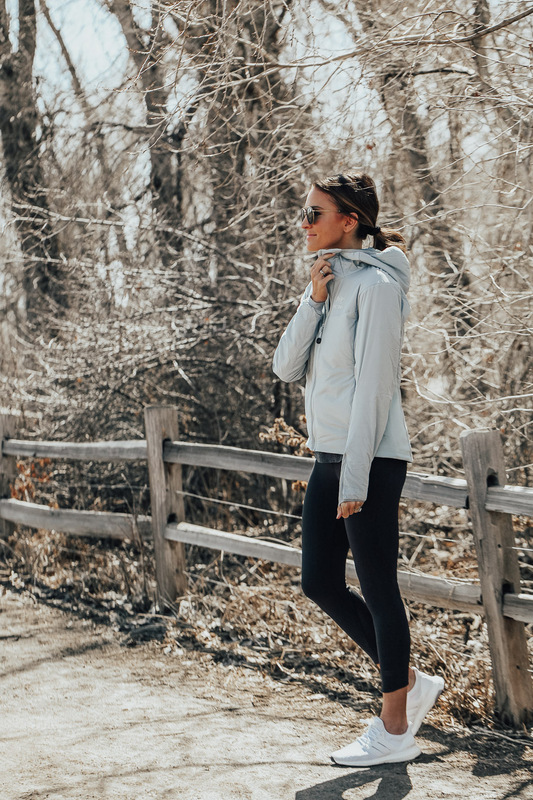 It’s still pretty cold here in Boulder so having the right layers is key! 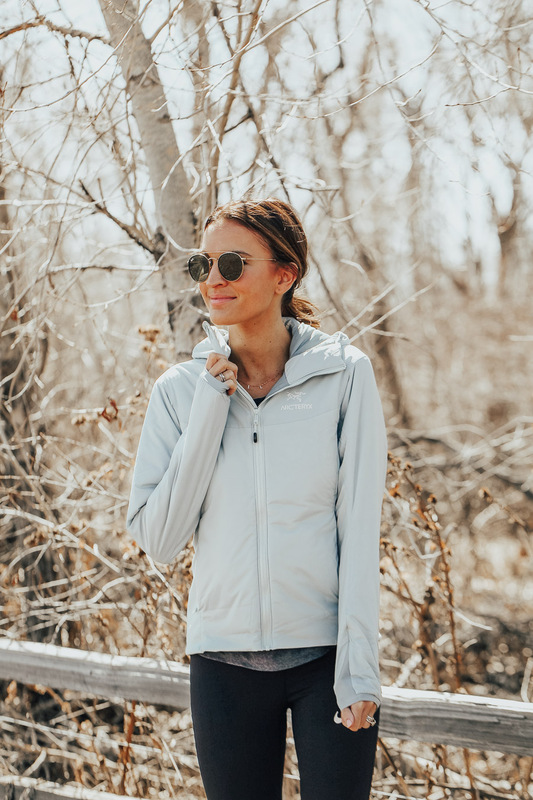 Backcountry is a go-to for me when it comes to any outdoor gear, including running! 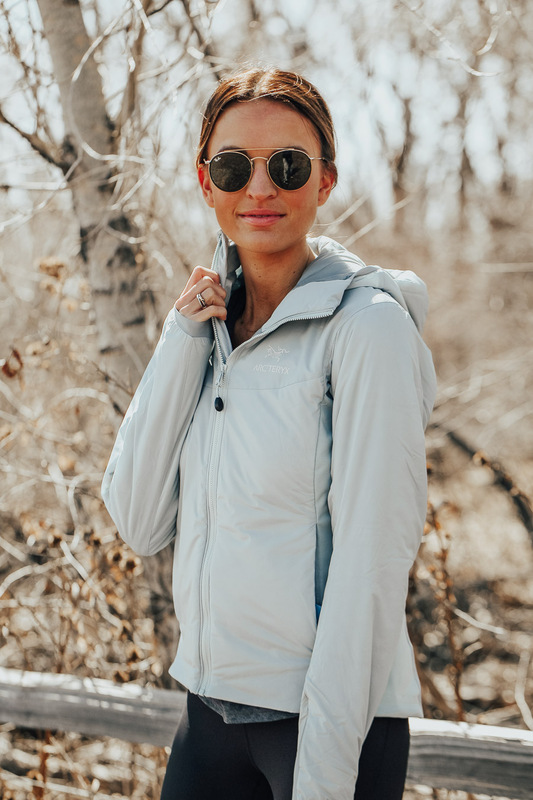 They have so many amazing spring jackets that are perfect for this time of year. 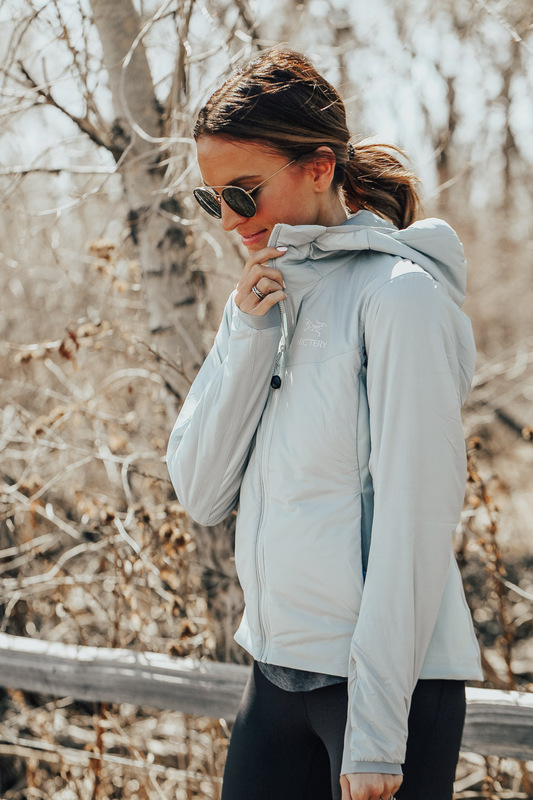 I love this Arc’teryx jacket not only for running, but also hiking, going for walks when its still chilly…and it also works as a great layer for skiing / snowboarding too! 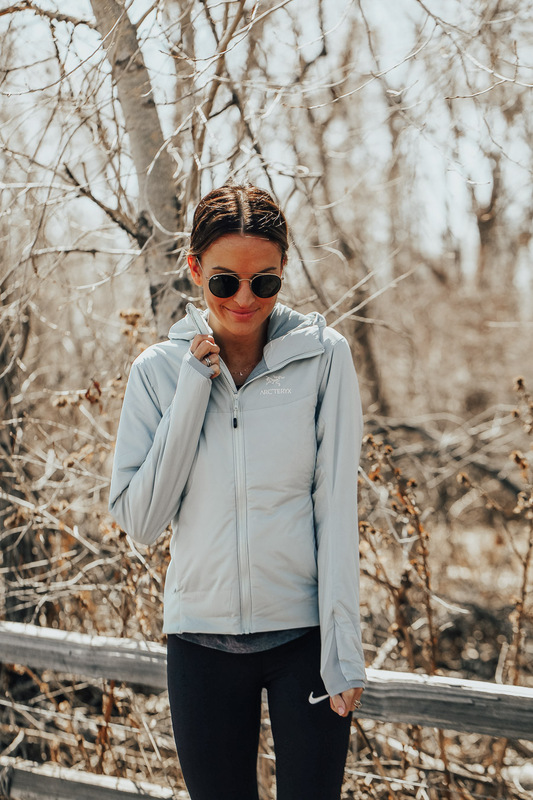 It’s such a versatile jacket for any outdoor activity and I thought this color was gorgeous for spring! Don’t forget – you can get 15% off your Backcountry order with the code LAURENKS15! If you’ve felt unmotivated lately or like you’ve fallen off the wagon with working out…let today be your day 1. Remind yourself that you are worth taking care of – mentally, emotionally, and physically. And working out, getting outdoors, being active, is one of the best ways you can take care of yourself! Thanks for reading! This post was created in collaboration with Backcountry. As always, all thoughts and opinions are my own! So true! I’ve never NOT felt better after a workout, no matter how much I didn’t feel like doing it when I started.